The French novelist George Sand was one of the most successful female writers of the nineteenth century. 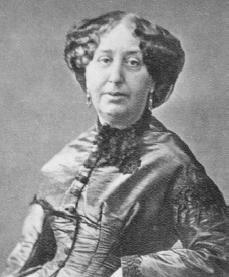 George Sand was born Armandine Aurore Lucille Dupin in Paris, France, on July 1, 1804. Her father, Maurice Dupin, was related to a line of kings and to the Maréchal de Saxe (Marshal of Saxe); her mother, Sophie, was the daughter of a professional bird fancier who came from a humble background. Maurice Dupin was a soldier and died when Aurore was four years old. After her father's death, Aurore, her mother, and her grandmother moved from Paris to Nohant, France. At the age of fourteen, Aurore was sent to the convent (a community for nuns) of the Dames Augustines Anglaises in Paris. Though she was often rebellious against the convent's peaceful life, she also felt drawn to quiet, deep thought and direct communication with God. To save Aurore from mysticism (the belief that communication with God can be achieved through spiritual insight), her grandmother called her to her home. Here Aurore studied nature, practiced medicine on the peasants (poor, working class), read from the philosophers of all ages, and developed a passion for the works of French writer François René Chateaubriand (1768–1848). Her colorful tutor encouraged her to wear men's clothing while horseback riding, and she galloped through the countryside in trousers and a loose shirt, free, wild, and in love with nature. Aurore became mistress of the estate at Nohant when her grandmother died. At nineteen she married Casimir Dudevant, the son of a baron and a servant girl. He was goodhearted but coarse and sensual, and he offended her far-fetched ideal of love. At the age of twenty-seven Aurore moved to Paris in search of independence and love, leaving her husband and children behind. She began writing articles to earn her living and met many writers. Henri de Latouche and historian Charles Sainte-Beuve (1804–1869) became her mentors. Aurore fell in love with Jules Sandeau, a charming young writer. They collaborated on articles and signed them collectively "J. Sand." When she published her first novel, Indiana (1832), she took as her pen name "George Sand." Eventually her affair with Sandeau dissolved. Then she met the young poet Alfred de Musset (1810–1857), and they became lovers. George Sand legally separated from her husband; she gained custody over their daughter, Solange, while her husband kept the other child, Maurice. She had come to enjoy a great reputation in Paris both as a writer and as a bold and brilliant woman. She had many admirers and chose new lovers from among them. Her lovers included the Polish composer Frédéric Chopin (1810–1849). Every night from midnight until dawn, George Sand covered her daily quota of twenty pages with her large, tranquil writing, never crossing out a line. All her novels are love stories in which her romantic idealism unfolds in a realistic setting. The early works by George Sand are novels of passion, written to lessen the pain of her first love affairs. Indiana (1832) has as its central theme woman's search for the absolute in love. Valentine (1832) depicts an upper-class woman, unhappily married, who finds that a farmer's son loves her. Lélia (1854) is a lyrical but searching confession of the author's own physical coldness. Lélia is a beautiful woman loved by a young poet, but she can show him only motherly affection. Le Compagnon du tour de France (1840), Consuelo (1842–1843), and Le Péché de Monsieur Antoine (1847) are typical novels of this period for the author. She sympathized in these novels with the difficult lives of the worker and the farmer. She also wrote a number of novels devoted to country life, most produced during her retreat to Nohant. La Mare au diable (1846), La Petite Fadette (1849), and Les Maîtres sonneurs (1852) are typical novels of this genre. As George Sand grew older, she spent more and more time at her beloved Nohant and gave herself up to the gentle, peaceful life she created for herself there, the entertainment of friends, the staging of puppet shows, and most of all to her grandchildren. Though she had lost none of her vital energy and enthusiasm, she grew less concerned with politics. Her quest for the absolute in love had led her through years of stormy affairs to reaching a tolerant and universal love—of God, of nature, and of children. She died in Nohant on June 9, 1876. Dickenson, Donna. George Sand: A Brave Man, the Most Womanly Woman. New York: St. Martin's Press, 1988. Jack, Belinda. George Sand: A Woman's Life Writ Large. New York: Knopf, 2000. Sand, George. Story of My Life: The Autobiography of George Sand. Edited by Thelma Jurgrau. Albany: State University Press of New York, 1991.